It is a beautiful piece that is certainly well worth the investment. Danforth did a splendid job preparing the item after the order and providing me with the tools to customize the diamond setting prior to purchase to make sure I was getting what I wanted. 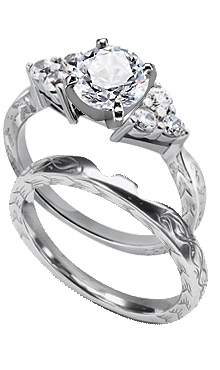 This sparkling 14K White Gold matched set is engraved. The band has a lovely wheat pattern and notched to allow it to fit snugly against its engagement ring with the same pattern. The ring has three round diamonds on either side of the center setting for a total of six with a color of G-H and clarity of SI and an approximate total weight of .33 carat.